Between the years 1892 and 1896, this was the location of Bachelor City. Surveyed in January of 1892, by March, nearly 100 houses had been built. A dozen saloons, four hotels, school, city hall, church, and a town newspaper once existed here. Today there is a historic plate and a turnout at the north end of Bachelor loop, north of Creede. Nothing can be seen from the turnout. Once you walk into the field you immediately step on rusted tin cans, rotted boards, and occasionally stumble into a hole a few feet deep. The entire area is a debris field, and at least three cabins remain in the trees on the outskirts. When I was there in July 2007, a couple with a Texas plate were digging up the area with a metal detector. The main street was once here, running away from the camera. In the distance of trees far from the side, you can barely see one of the cabins. Date Taken: 2007:07:14 12:42:07 Want to use this image? See the More information tab. This would have been the center of town, as seen from the turnout. Nothing remains now. From this view, one cabin is in the trees straight ahead and to the left slightly, the other two are far left. Date Taken: 2007:07:14 12:42:32 Want to use this image? See the More information tab. Date Taken: 2007:07:14 12:44:05 Want to use this image? See the More information tab. Although there is no way to know the names of the occupants, the three structures with significant remains were protected by trees. Date Taken: 2007:07:14 12:45:21 Want to use this image? See the More information tab. At 10,500 feet, Bachelor City could never have lasted long without humans. Nature always retakes what we have taken. The remains of one structure are in the distance. This shot was taken near the road looking back. One structure will soon disappear, a victim of time. Note the tin in the center, probably part of the roof at once time. Date Taken: 2007:07:14 12:45:54 Want to use this image? See the More information tab. Date Taken: 2007:07:14 12:52:10 Want to use this image? See the More information tab. This structure was completely in the trees and was also in the best shape of them all. 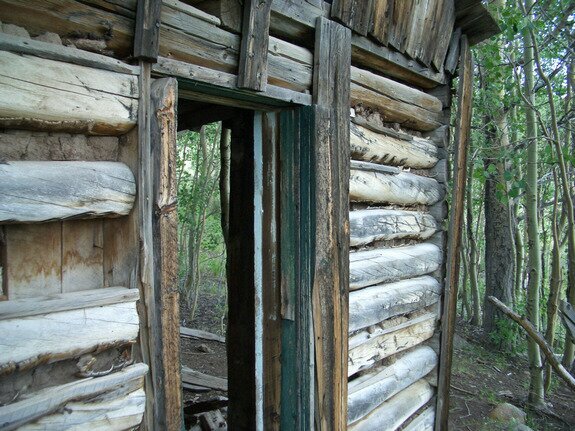 It will be gone soon, as holes inside the cabin (in the dirt floor) were the result of the Texan's careless destruction of history. Date Taken: 2007:07:14 12:55:04 Want to use this image? See the More information tab. Same structure as 0241, looking back towards the front through a side window and out the front door. Date Taken: 2007:07:14 12:57:16 Want to use this image? See the More information tab. A cabin in the woods, with the parking lot (and my car) visible in the distance. Date Taken: 2007:07:14 13:06:59 Want to use this image? See the More information tab.